Just a quick one, because we’re in the midst of packing for camping (again)… Here are some great tech-free toddler/pre-school summer arts & crafts I found poking around online. Linked to instructions when available! These crafts may take some supervision for the very young. The end result will delight young toddlers, and the activity along the way keeps older toddlers busy! These ideas don’t take a ton of crazy materials. I think the weirdest item you’ll need is plaster of paris for the goo/chalk. Most are made with items many people have around the house. Enjoy! Let your child decorate their snack bags with pipe cleaners, stickers, and googly eyes! (may require some help). Create simple finger puppets using old rubber gloves! Waterproof for bath time fun as well! Teach your child to help wildlife with this easy bird nesting bag craft! Make your own chunky sidewalk chalk for coloring on sidewalks and driveways. Love this idea for creating a continuous coloring easel using a roll of paper, over the door hooks, and curtain rod/dowel! (I am just getting into coloring with him). I’m totally making this paper tube rain stick for my son – he loves to make noise, and I think I’d rather hear this than wooden trucks knocking about! This is so simple, it’s almost ridiculous. Let your baby tear paper (magazines, construction, etc) into strips. I’ve read this is an important pre-scissors skill. And babies love it. If you have an older child, they can make a collage with the torn strips, so this is a good craft for siblings! Create a decorated vase or pencil holder by having your toddler apply stickers to an empty soda bottle, disposable coffee cup or other container. (Tip: Use those sheets and sheets of mailing labels that come in the mail for sticker practice before using up your “fun” stickers.” Early sticker-artists won’t really care as long as they get to stick, stick, stick!). I tried this Wonder Kleenex Box craft – granted, I had to assemble it – but I found it to be a great no-sew use for my TONS of scrap fabrics I have and my son loved playing with it too (nice quiet activity for car rides!). I didn’t have an empty tissue box handy, but I have several old wipes cases I was saving! Perfect! Make temporary bean bags with zip snack bags filled with beans, rice, or unpopped corn kernels. (Be sure you’re using bags with a good seal!). Kids will love to measure in the beans/filler. Or might want to mix them for a fun multi-colored effect! Need I say – always supervise children when doing crafts. COVER your table/floor appropriately (you could make this easy 1-hour Cornered Tablecloth!) And be near a sink. What are some fun and easy toddler arts and crafts activities you’ve done with your toddlers? (Pre-scissors phase). 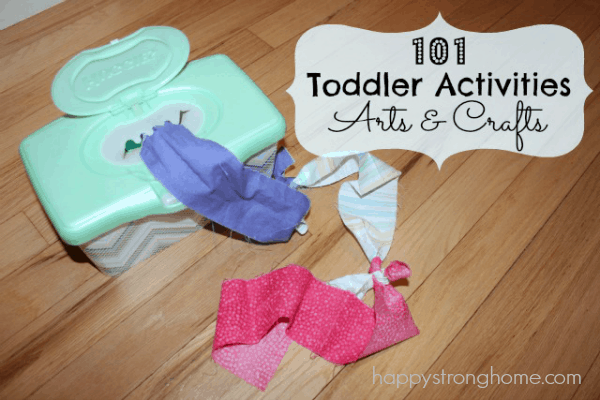 Have you checked out the rest of my 101 Toddler Activities? So many great ideas here! I wish I would have found this this summer…but now I have things for school breaks! Hi there! found this on Pinerest and cannot wait to try the diaper wipe/fabric pull idea!! What a great way to re-purpose one of the million tubs I have lying around! Glad I stumbled upon your blog! That fabric scrap pull using the wipes case is genius! My baby LOVES to pull out wipes and I am always taking them away. Perfect solution!! Yesterday I did a craft with my 19 month old. I was inspired by this post. We took some empty containers that I use for snacks and I let him put stickers all over them. Now I am going to go over them with tape to make sure the stickers stay put. When they start to look gross, we will take the tape off and do the craft over again. Thanks for all your great posts. The wonder kleenex box was the best idea – I like the way you did it best. I’ll be putting one of those together this week. Thanks for the ideas. We’re going to do the finger puppets and the rain sticks. Possibly the art easel but I’m thinking for sure she would figure it out and pull all of it off! We get a huge roll of packing paper, the brown stuff that you wrap around the package… I tear a big sheet off and tape that to the wall. The newspaper behind it is a good idea. A lot of crafts I have found require paper plates so I often pull those out for dd to color/paint/sticker so that we have some predone for a project. She can stay interested in a craft only so long. Basically, she colors it and when she’s taking a nap I finish it! !